Oceana Beach & Wildlife Reserve is a sanctuary for weary souls, a place of breathtaking beauty, where animals roam free and guests are free to explore. Spectacular and unique, Oceana offers a truly special luxury boutique hotel experience. The property is perfectly positioned within a sprawling wildlife sanctuary, fronted by a pristine 7km stretch of private beach. This is where guests go for a “holiday whilst on holiday”. Spacious and airy, all of our luxury accommodation options offer captivating views of the sand and sea, framed by indigenous shrubs and trees that create an easy island-living feel. Accommodation options include seven double Suites, as well as a magnificent Private House with three double en-suite rooms. Onsite attractions include safari drives, spa, fine dining, swimming and beach activities, with many others to be enjoyed in and around the charming nearby town of Port Alfred. Oceana is located on the warm Indian Ocean, within easy driving distance of Port Elizabeth as well as other reserves. Exclusive, yet unpretentious, this property ticks all the boxes for an unforgettable holiday. Set in a spectacular and unique environment, Oceana offers a truly special luxury boutique experience. The property is perfectly positioned within a sprawling wildlife sanctuary, fronted by a pristine 7km stretch of private beach. With absolutely everything taken care of by our discreet staff, this private and intimate destination is where guests go for a “holiday whilst on holiday”. Spacious and airy, all of our luxury accommodation options offer captivating views of the sand and sea, framed by indigenous shrubs and trees that create an easy island-living feel. We have seven double Suites to choose from, all with private decks and full bathrooms. Guests may also choose to book the magnificent double-storey Private House, with three en-suite double rooms. The Private House has private access, a spacious lounge with fireplace, private plunge pool on the deck, as well as a fully equipped kitchen, bar and dining area for effortless entertaining. The reserve is home to more than 220 species of bird and 30 animal species, including rhino, giraffe and many others than can often be viewed from your suite. On-site attractions include safari drives, spa treatments, fine dining, games room, swimming and beach activities. From golf to fishing, birdwatching and more, there are also many other activities to be enjoyed in and around the charming town of Port Alfred. Oceana is located on the warm Indian Ocean, close to Port Elizabeth as well as Big 5 reserves. Exclusive, yet unpretentious, this property ticks all the boxes for an unforgettable holiday. The Oceana Beach and Wildlife Reserve is situated 9km East of Port Alfred on the R72 in Eastern Cape, South Africa. Oceana is set on 7 kilometres of private beachfront, overlooking the Indian Ocean. Being the only wildlife reserve which is located on the beach in South Africa, this sanctuary is surrounded by picturesque landscape which is unique and spectacular. Oceana Beach and Wildlife Reserve could be described as the place at which paradise and worldly perfection meet, where almost endless pristine beaches and rolling vegetation blend seamlessly against a backdrop of eternal skies. Oceana combines beach, bush and game to provide the ultimate in holiday indulgence. Port Alfred accommodation is in 10 individually and sumptuously appointed suites. 3 of the lodge suites are positioned in the main house, while the 4 Ocean Suites are free-standing units that are beautifully placed amongst the trees. The Private Ocean House is a sole-use option and houses the other 3 suites. 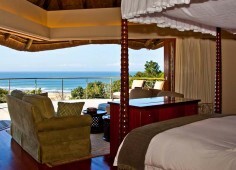 All 10 suites feature private viewing decks with spectacular bush and ocean panoramas. Do as you please at Oceana. Enjoy 5-star dining at the top-class restaurant or escape to the beach for a romantic candlelit dinner. Enjoy a dune buggy ride down to the dunes and sip champagne as the sun slowly makes its way below the horizon. Make virgin footsteps along the pristine beach and frolic in the warm waters of the Indian Ocean. Spoil yourself with a spa treatment and spot buffalo, rhino and giraffe on a game drive through the reserve. And there are many more water and land-based activities at this Eastern Cape reserve to keep you entertained! Adventure, Beach / Coastal, Birding, Fishing, Flora, Golf, Gourmet, Leisure, Nature, Relaxation, Wildlife, Wine, And more. Move from Cape Town to Franschhoek winelands, then Hermanus to Knysna and Plettenberg Bay. From here drive south to Port Elizabeth and Shamwari Game Reserve to end your journey of exploration in Port Alfred. Discover some of South Africa’s best destinations on this 22-day self-drive holiday. Your personal adventure takes in whale watching, Great White Shark cage diving, Robben Island and scenic beauty beyond description. Luxury accommodation includes meals, wine tastings, spa therapies and gym workouts.